The Sony a7 III packs some of the most advanced full-frame camera technology and features currently available into a high-performance body that is accessible to a wider spectrum of photographers and videographers, from enthusiast to pro. 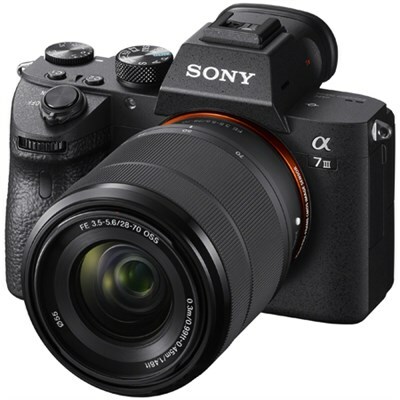 Every aspect of this remarkable camera has been refined for extraordinary full-frame image capture control and quality, from the image sensor and image processing system right down to the smallest operational details.The a7 III has been refined for extraordinary image capture control and quality from the next generation 24.2MP full-frame BSI image sensor and latest BIONZ X image processor, down to the smallest operational detail. Featuring 693 phase AF points with up to 10fps continuous shooting 4K HDR video and the longest battery life of any mirrorless camera to date - the a7 III has everything you need. With outstanding imaging capability and high-speed performance contained in a compact body, the a7 III gives you the power, precision, and flexibility to capture once-in-a-lifetime moments just as you like. The newly developed 24.2MP back-illuminated Exmor R CMOS image sensor is paired with a front-end LSI that effectively doubles the readout speed of the image sensor, as well as an updated BIONZ X processing-engine that boosts processing speed by approximately 1.8 times compared to the a7 II. This results in high sensitivity with low-noise performance and wide 15-stop dynamic range. It also has the ability to output 14 bit RAW format even when shooting in silent or continuous mode. Nothing less than spectacular images. The 35-mm full-frame CMOS image sensor with back-illuminated structure enhances light collection efficiency, expands circuitry scale, and, with the help of a copper wiring layer that contributes to quicker data transfer, outputs data at very high speed, while minimizing noise to reveal fine details in every picture. AF performance is improved using the same AF advancements as in the a9 and applying it optimally. Once the a7 III captures such unpredictably moving subjects as dancers, boxers, and wild animals in action, it won't easily let them go. Combining focal-plane phase-detection AF for excellent speed and tracking plus high-precision contrast-detection AF, Sony's sophisticated Fast Hybrid AF can capture fast-moving subjects in razor-sharp images. This system advances performance to double AF speed. The AF performance inherited from the a9 accounts for AF tracking with enhanced precision for continuous shooting of quick action. With faster image sensor readout, even complex subject motion can be tracked and sudden movements can be predicted with great precision, letting you capture decisive moments. 693-point focal-plane phase-detection AF not only covers a wide area and responds instantly-it offers the benefits of high tracking performance even with an A-mount lens mounted via mount adaptor LA-EA3. With the a7 III, Eye AF can now be used with AF-C mode, for fast, effective eye detection/tracking performance when shooting stills - Even if face is partially hidden, Even if face is partially hidden, Even when looking down, Even when looking down, Even when backlit, and Even when backlit. The easy maintenance of optimum focus on moving subjects can totally transform your portraiture. The a7 III has Touch Focus function, and a Touch Pad function for you to fingertip-drag the focus frame intuitively while using the viewfinder. The a7 III can shoot in a continuous burst at up to 10fps with AF/AE tracking and up to 8fps burst shooting when shooting with live-view mode. The camera also supports silent shooting at up to 10fps with AF/AE tracking at maximum resolution. Capture an instant action with continuous shooting of up to 10fps-or 8fps for live-view shooting-with AF/AE tracking. Up to approximately 177 JPEG (standard) images, 89 compressed RAW images, or 40 uncompressed RAW images can be captured in one continuous burst. This camera allows silent shooting at up to 10fps with AF/AE tracking. Silence is critical for various scenes, when even slight noise can mean missing a chance at an ideal shot. Full-pixel readout without binning in 35-mm full-frame mode makes it possible to condense approx. 2.4 times the data required for 4K movies (QFHD: 3840 x 2160), minimizing moire and jaggies. Full-frame or Super 35-mm mode can be selected as needed. Furthermore, 4K recording employs XAVC S format at bitrates as high as 100 Mbps. The a7 III's operability is enhanced by fast control during shooting, dazzlingly clear views through the Tru-Finder, versatile connectivity, and extended shooting endurance from various power sources, plus high durability and resistance to wet or dusty conditions. The a7 III can use a NP-FZ100 battery with approx. 2.2 times as much capacity as a NP-FW50 battery, allowing you to shoot up to approximately 710 photos with one full charge. BC-QZ1 optional battery charger allows quicker charging than charging via USB. With two media slots, including one that's UHS-II-compatible for fast data writing, the a7 III can simultaneously or relay record, separate RAW/JPEG data and stills/movies, and copy data between cards. Imaging Edge software suite can maximize image quality, improve production efficiency, and help you finely adjust RAW-based images. Use its Remote to remotely control shooting while monitoring scenes via live-view PC screen; Edit to develop RAW data into high-quality photos; and Viewer to view, rate, and select photos from a list of shots. Other Features: Eye-start AF (only with LA-EA2 or LA-EA4 attached (Sold separately)), Lock-on AF, Eye AF, AF micro adjustment with LA-EA2 or LA-EA4 (sold separately), Predictive control, Focus lock, AF Track Sens, Swt.V/H AF Area, AF Area Regist. Exposure Bracketing:Bracket: Cont., Bracket: Single, 3/5/9 frames selectable. With 3 or 5 frames, in 1/3, 1/2, 2/3, 1.0, 2.0, or 3.0 EV increments, with 9 frames, in 1/3, 1/2, 2/3, or 1.0 EV increments. Flash Bracketing: 3/5/9 frames selectable. With 3 or 5 frames, in 1/3, 1/2, 2/3, 1.0, 2.0, 3.0 EV increments, with 9 frames, in 1/3, 1/2, 2/3, 1.0 EV increments. *1 Phase-detection AF may not work with certain lenses or may require lens software update. See Sony support page for details. *2 With compatible Sony external flash. *3 With compatible external flash. *4 Varies according to shooting conditions or memory card used. *5 Supports Micro USB compatible device. *6 Sony accessories for the Accessory Shoe can be attached. *7 The LCD screen is turned on, shot once every 30 seconds, operate zoom alternately between W and T ends, flash strobe once every two times, turn power off and on once every ten times. *8 Continuous movie recording is possible for approximately 29 minutes (limited by product specifications). *9 Indication recording time, which is defined by repeating the cycle: Power on, start recording, zoom , stand-by and power off. *10 The total movie recording time. When the limit of the continuous movie recording time (29 minutes) is reached, let the camera continue movie recording by pressing the MOVIE button again. No other operation such as zoom is performed.